Terribly sad news: Ricardo Elizondo Elizondo, a Mexican writer who will be remembered as one of the greatest of the 20th and early 21st centuries, has passed away. For those of you not familiar with his magnificent work, check out his short story, "The Green Bottle," translated by Geoff Hargreaves, (PDF) which appeared in my anthology, Mexico: A Traveler's Literary Companion (Whereabouts Press, 2006) and is reprinted on the National Public Radio webpage. Ricardo Elizondo Elizondo fue, ante todo, un tipo divertido. Un hombre brillante, erudito en algunos temas sociales y literarios, experto en los auténticos vampiros, antes de que se pusieran de moda. Sabía todo de crucifijos y ataúdes para colegas de Nosferatu. Me encantaba escucharlo en sus conferencias sobre Maximiliano y Carlota o la poesía de García Lorca. Nos transportaba al Guadalquivir, a ver en vivo el romance del gitano con la mozuela que tenía marido. En el Tecnológico de Monterrey, Campus Monterrey, presentó mi novela Historias íntimas de la casa de Don Eulogio. En 2006, la editora C.M. 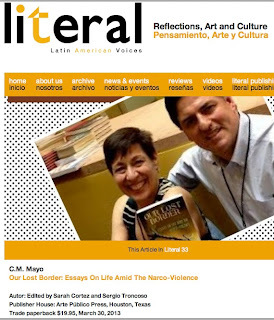 Mayo publicó un cuento suyo y uno mío en la antología Mexico: A Traveler's Literary Companion. La estación de radio NPR publicó ambos cuentos, en inglés y español, en su sitio web. Me sentí muy orgullosa de estar como autora junto a él. Gran narrador, buen amigo, lo recordaré siempre. Que el infinito te reciba, Ricardo, y que la vida eterna sea feliz, setenta veces siete. Uyy, this is so 2013. Is the Fourth Amendment Now Illegal? Alex Tabarrok both wisely and alarmingly asks. It's 1984 in New York City. I am genuinely surprised there has not been more outcry about Mayor Bloomburg's aggressive misuse of the police force against citizens. More than kind of reminds me of what historian Stanley Ross said of Porfirian Mexico, that the so-called "necessary man" made Mexico "safe for the right people." The comments are the best part of this NYT article about one Spanish mayor's solution to the dog poop problem. Very 1984-ish, too, but hilarious and effective! P.S. Nothing beats Mutt Mitts. Come on, grocery bags are disgusting. The Contrary Farmer on organic GMOs (Spinach good, fish genes bad?) Rather eye-crossing. Can these children please grow up and sue somebody (preferably not their parents)? To end today's thoroughly downer of a post, here is a positive thoughtoid. If you don't like the looks of your house, you will feel ever so much better after looking at these. So my Marfa Mondays Podcasting Project got temporarily hijacked. Resuming ASAP! There are 11 podcasts so far, and there will be 24. I have been off reading about the Mexican Revolution (well, that is relevant to Marfa, after all... as we shall see...) for the revised and expanded introduction to my translation of Francisco I. Madero's secret book of 1911, Spiritist Manual, which has turned into a book itself. And it will be out this fall in both English and Spanish. And ayyy I am still revising... Hope to have it done and off to the editor this week. Today, a little more about Dr. Krumm-Heller's osmotherapy, a kind of protoaromatherapy. Fun factoid: Dr Krumm-Heller was practicing osmotherapy on the battlefields of the Mexican Revolution-- carrying around his vials of perfume to aid fallen soldiers. 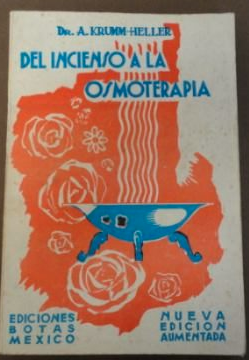 So though he did not publish his book, Del incienso a la osmoterapia (From Incense to Osmotherapy) until the 1930s, we do know he was practicing it while in Mexico with Madero, and in fact wrote the first draft of the book in Mexico at that time. Herewith a few excerpts to give you a flavor of this most extraordinary work. God wish it that this book may come to the hands of an impartial scientific researcher, one free from all official dry and dogmatic ideas, but capable of appreciating the value of the sentiment and approach of progressive thinking. May the reader not overlook that, moreover, I have had access to the old archives of Mexico and all the historical documents on the now historic primitive peoples' science of the correlations. The Jewish synagogues of Spain had valuable libraries that ended up in the monasteries after the expulsion of the Jews from Spain. There I had access to notable literary works on Mexico and Peru, and from which I extracted priceless material. The ancient uses in the Mayan mysteries prescribed as oblations not only butterflies but especially roses. We find identical uses in the gnostic church, where they burn roses on the altar and bring sick people there, to cure with them with their perfume. In Latin America, sorcerers employ all possible substances as carriers of poisons; most frequently, ashes, other times salt and even soap. The victim receives a gift of a little bar of soap and not long afterwards, he falls ill from its use. Meanwhile, the Indians also say that on the higher levels there are not only evil beings but also good ones. The bad ones show low and Satanic things, they incubate fetid emanations; as for the superior, divine and angelic beings, they love perfumes. When we adopt this way of seeing, we understand how much we have in our hands to draw close to these geniuses, both divine and diabolical, by giving one or another them their vital element, whether that is a agreeable smell or a foul odor. But it is necessary to utilize for each one only what is adequate. To be alerted when my book (revised and expanded edition of Madero's Spiritist Manual) is available, click here. NA RB 242 Captured German Documents, T141, Roll 20, von Eckhardt to vn Bethmann Hollweg, May 17, 1916. >Read von Feilitzsch's blog post on Krumm-Heller. 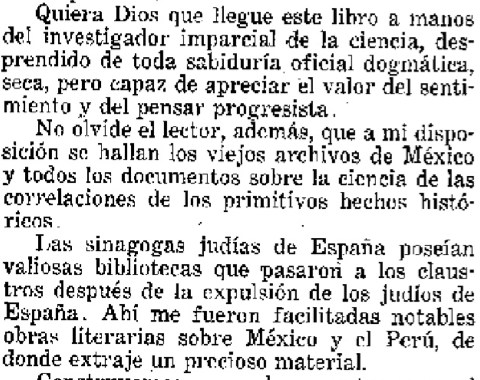 Ricardo Pérez Montfort's essay, "El doctor Arnold Krumm Heller en México, 1910-1935. 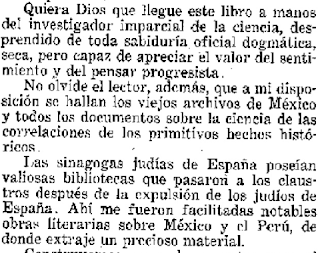 Entre el esoterismo, el nacionalismo y la osmoterapia" is in his collection, Cotidianidades, imaginarios y contextos, ensayos de historia y cultura en México, 1850 1950. I have yet to get my hands on a copy (I hope this week). . . .
From the bit I found on-line it seems that Krumm-Heller had his doctor's office in Mexico City on the Calle del Empedradillo near the Monte de Piedad (which is on the corner of the Zocalo next to the Cathedral); he was part of the Junta Permanente of the Second Spiritist Congress, and through these members he met Francisco Madero; later became Madero's doctor. Arnold Krumm-Heller, who was in Mexico City in the 1900s, returned to Germany in the 1920s, and wrote vastly on the racial superiority of the Aryan and Aztec races. He blended theosophy, Freemasonry, racial theories, and his own orientalism vis-a-vis pre-Hispanic Mexico. By 1914, for him, Carranza's Mexico would resist the lure of the American (U.S.) mermaids, and would follow Germany's spiritualist call, rediscovering their Aztec (quasi-Aryan) past. R. William Weisberger, Wallace McLeod, and S. Brent Morris, ed., Freemasonry on Both Side of the Atlantic: Essays Concerning the Craft in the British Isles, Europe, the United States, and Mexico (Boulder: East European Monographs; New York: Columbia University Press, 2002); Arnold Krumm-Heller, Mexiko, Mein Heimatland! (1919); and Roberto Pérez Montfort's essay noted above. More detail on Krumm-Heller in Spanish on the website for the Fraternitas Rosicruciana Antigua, a Venezuelan organization based on his teachings. 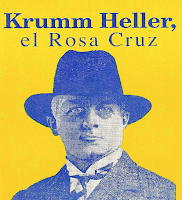 It claims that when Krumm-Heller arrived in Mexico he joined the Masonic Lodge, Gran Logia Valle de México. 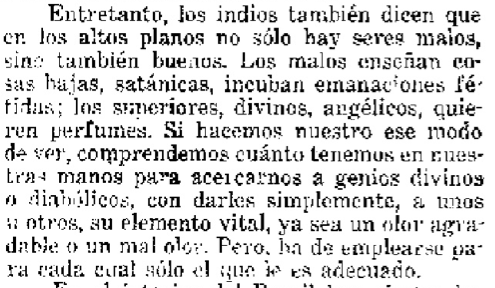 Also according to this article, in 1912 his play, La Ley de Karma, was performed in Mexico City at the Teatro Abreu and in 1913 he published Conferencias Esotéricas, la evolución del planeta y de las razas humanas, curación de las enfermedades y la prolongación de la vida por medio de ejercicios repiratorios (PDF download). Conferencias esotericas has some rich autobiographical information which is summarized on the www.gnosis2022.com website (in Spanish). And I note that the Spanish translation of his novel, Rosa Cruz, novela de ocultismo iniciático, was published by Maucci in Barcelona-- the very same to publish an edition (not the original) of Madero's Manual Espírita in 1911. 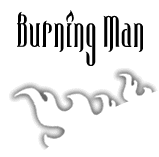 >Find a scribd listing of downloadable copies of many more of Krumm-Heller'sbooks here. UPDATE: Blog post on this book here. In 1915, President Madero procured a professorship in German language and literature for him, also making him a lieutenant-colonel and physician to the General Staff. But of course by 1915 Madero had been dead and buried for two years. Could be a typo? Did he mean Carranza? Not sure what the sources are. "In February 1911, when Madero launched the revolutionary struggle by combat, his friend Arnold Krumm Heller accompanied him, as well as many friends from his lodge and who shared his ideas. Krumm Heller had studied homeopathy in Germany with the direct disciples of Hahneman, and Occult Medicine with Papus in France (he also knew the natural medicine of the indigenous Mapuches, Incas, Mayas and Aztecs) and he was an experienced medium and genuine healer of a thousand remedies. He worked on these daily in his Mexico City laboratory and office. Now our man participates alongside Madero in his revolutionary act as he assumes the office of Inspector General of Medical Services in the Campaign." En Febrero de 1911, Madero emprende la lucha revolucionaria en el frente de combate; su amigo, Arnoldo Krumm Heller le acompaña, entre otros muchos compañeros de logia y de ideales. Krumm Heller que había estudiado Homeopatía en Alemania, con los discípulos directos de Hahneman, y la Medicina Oculta, con Papus en Francia; (la medicina natural de los, aborígenes mapuches, incas, mayas y aztecas, le era también conocida) era un experimentado taumaturgo y genuino sanador de mil recursos. A diario lo reiteraba en su laboratorio y consultorio de Ciudad de México. Ahora nuestro hombre participa al lado de Madero en su gesta revolucionaria y asume las funciones de Inspector General de los Servicios Médicos en Campaña. 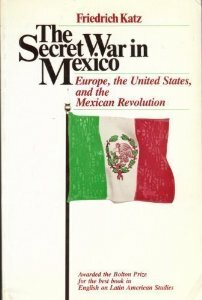 Those up on their Mexican revolution reading will want to ask, is Arnold Krumm-Heller mentioned in Friedrich Katz's The Secret War in Mexico: Europe, the United States, and the Mexican Revolution? Why, yes, indeed, pp. 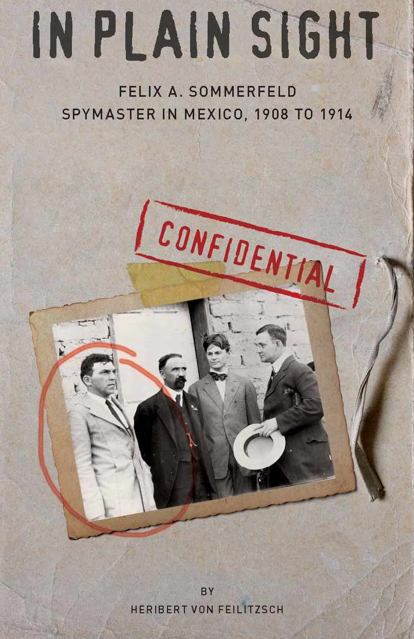 428-429, but abruptly, starting when Krumm-Heller described only as a "doctor," who "rallied to Carranza in 1913 and had sent messages to the German authorities then supporting Huerta in which he urged them to back Carranza. The reply was hardly flattering: the German authorities called him a criminal and a madman..."
Katz cites the source for that as AA Bonn, Mexico 16, vol. 3, Eckhardt to Reichskanzler, 7 August 1918. The problem in evaluating this is, as Katz himself says, though in reference to a different matter, the German secret services were in continual conflict among themselves. Was Krumm-Heller a madman? Well, it's important to remember that many people (then and now) considered anyone who showed even the slightest interest in Spiritism, Theosophy, in short anything in anyway occult, loonier than a loon, and certainly Krumm-Heller was very interested all such matters, so it is not surprising that someone somewhere made such a statement about him. 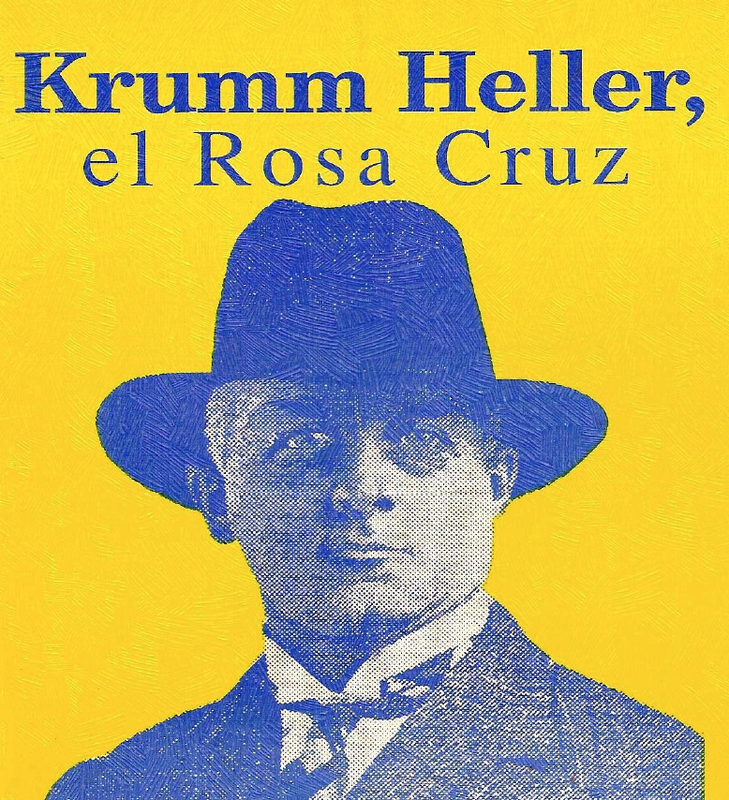 As for my own research to date re: Francisco I. Madero, I have not found any other references to Krumm-Heller in the main literature on Madero and the Revolution 1910-1911, nor in Madero's collected correspondence (Epistolerio 1900-1909 vol I and 1910 vol. II). Nope, not in David Dorado Romo's Ringside Seat to a Revolution, either (though he says quite a lot about Teresa de Urrea and the Spiritist Lauro Aguirre). Neither is there a mention of Krumm-Heller in Yolia Tortolero's (magnificent) El espíritismo seduce a Francisco I. Madero. 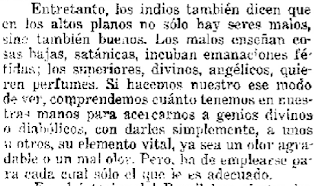 However, the world of esoteric studies in Mexico was a small one and Madero did attend and in fact sponsor several magazines and conferences both before and after 1910, when Krumm-Heller, fresh from his esoteric studies in Latin America and Paris-- with none other than Papus the great occultist--- arrived in Mexico City. It would be strange indeed if their paths had not crossed. Furthermore, both Madero and Krumm-Heller were Masons of the 33rd Degree and both were enthusiastic homeopathists. No doubt there are avenues aplenty for research here.... More info? Comments? In the remains of Madero's library at Mexico City's Centro de Estudios de Historia de Mexico CARSO, I found some books, including one of Krumm Heller's; Ciencia oculta de la medicina by Franz Hartmann, a translation from the English, Occult Science in Medicine (a German Theosophist and translator of the Bhagavad-Gita, Hartmann had been at Adyar, India with Madame Blavatsky); L’occultisme en le Spiritualisme, by Gérard Encausse, offering chapters on the astral body, the esoteric history of the white race, and the secret histories of the lost continents Atlantis and Lemuria (Encausse was a medical doctor and hypnotist otherwise known as “Papus,” the most famous Theosophist-turned-Occultist of his time, friend to the Spiritists and mystic to the Tzar of Russia (very down on Rasputin)—just to offer a grossly abbreviated description of this most energetic and charismatic Parisian personality); and Les mystères de l’être, by Ely Star-- any or all of which could have been on Krumm-Heller's own shelves and, who knows, may even have been gifts to Madero from Krumm-Heller himself. But I underline: that's just my own speculation. "[Krumm-Heller] received a document from Papus dated March 13, 1908 appointing him "Délégué Genéral pour le Chili, Perou et Bolivie" of the Martinist Order. He also received, for no fee, a document from Theodor Reuss dated March 15, 1908 appointing him "General Gross-Representanten für Mexico" of the Sovereign Sanctuary of the Ancient and Primitive Rite of Memphis and Mizraim." Theodor Reuss was the head of the OTO. More about him in the on-line article by T. Apiryon. Ordo Templi Orientis is the first of the great Old Æon orders to accept The Book of the Law, received byAleister Crowley in 1904 EV. 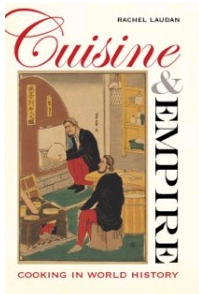 This book proclaims a New Æon in human thought, culture and religion. The Æon arises from a single supreme injunction: the Law of Thelema, which is Do what thou wilt. What did/ does the OTO have to with other Rosicrucian groups? Here's a compare and contrast on all the main modern Rosicrucian groups. In 1936-37, a pamphlet titled "Der Judenkenner" was circulated, in which Krumm-Heller and the late Theodor Reuss were denounced as agents of the "Judaeo-Masonic Conspiracy". Parsival recalls the circulation of ths pamphlet to their neighbors as a particularly frightening experience, but Krumm-Heller seemed relatively unconcerned for his safety until the last days of the war. The Nazis confiscated Krumm-Heller's library, but did not destroy it. Krumm-Heller and his son left Germany for America in 1937. The father returned to Germany in 1938, leaving Parsival in Mexico to attend school. Parsival returned to Germany in 1940. Carlotta, Krumm-Heller's second wife and Parsival's mother, died in 1945. It occurs to me that anyone who wants to do more research might find an angle in the papers of Aleister Crowley at the Harry Ransom Center, University of Texas, Austin. I did check the list of correspondents listed on-line and Krumm-Heller is not among them. But there might be something more. I would think. P.S. Portuguese website which argues that Krumm-Heller, of the white lodge, was against Crowley, of the black lodge. 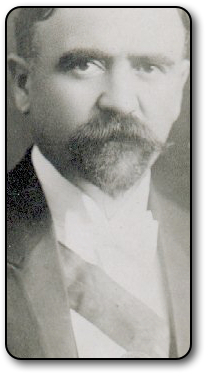 Almost done with the revisions to my introduction to my translation of Francisco I. Madero's secret book of 1911, Spiritist Manual (for those of you who are new to the blog, Madero was the leader of Mexico's 1910 Revolution and President of Mexico from 1911-1913). "FOX COTTAGE, LILY DALE, N.Y."Memorial to the Fox Family who lived in this cottage at the time Margaret [sic] and Katie Fox aged 9 and 11 years received the first proof of the continuity of life which was the beginning of modern spiritualism, March 31, 1848. This cottage was bought and moved from Hydesville, N.Y., its original site, to Lily Dale, N.Y., in May 1916 by Benjamin F. Bartlett. 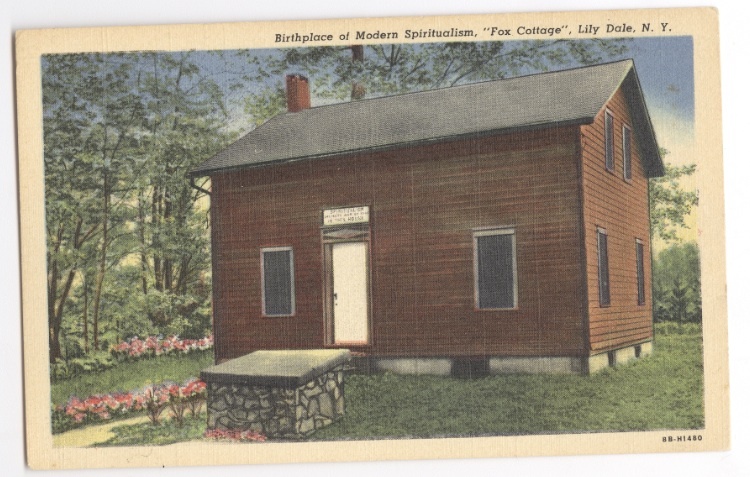 Lily Dale is the Mecca of Spiritualism. Visit the Lily Dale Assembly website here. Learn more about the history in Christine Wicker's excellent odyssey, Lily Dale: The Town That Talks to the Dead. Kate Fox, eleven, and her sister, Maggie, fourteen, determined that the spirit they called “Mr Split-foot” was that of a peddler who had been murdered and buried in the house. Conan Doyle, who went so far as to reprint the sworn April 11, 1848 testimony of both parents, was one of many Spiritualists, as they came to call themselves, who considered the events in the so-called “Spook House” of Hydesville “the most important thing that America has given to the commonweal of the world.” And whether one laughingly discards, ardently accepts, or would finely sift and resift ad infinitum the evidence of the existence of said murdered peddler and any communications from beyond the veil, the fact is that whatever it was that happened in Hydesville ignited an enthusiasm for “spirit” phenomena evoked in the ritual of the séance from channeling to table tipping to pencils and chalk stubs writing by themselves, or by means of a planchette; clairvoyance; flashes of light and floating orbs; levitation; ectoplasmic hands, feet and faces oozing out of velvety darkness; and “spirit photography” throughout the Burned-Over District, north to Canada, out west, south, to England and Ireland and, at full-gallop, across the European continent into Russia. Meanwhile, the Fox sisters received an avalanche of press, especially after P.T. Barnum put them on display in his American Museum on New York City’s Broadway, charging a dollar— then more than a tidy sum— to communicate through them to the ghost of one’s choice. (As science historian Deborah Blum recounts in Ghost Hunters, among those who paid their dollar were the novelist James Fenimore Cooper and Horace Greely, editor of The New York Tribune, both of whom left convinced that they had heard from spirit.) Scores of mediums now emerged, claiming to communicate with spirits as diverse as a drowned child, Egyptian high priests and “astral” beings; seeking them out in darkened rooms came legions of the bereaved, curiosity-seekers, skeptics on a mission, and not a few intellectuals (among them, novelist Victor Hugo, chemist Sir William Crookes, and naturalist Alfred Russell Wallace—more about them in a moment).
. . . furniture trembled, swayed, and rose from the floor (often without disturbing objects on its surface); diverse articles soared through the air; the séance room itself might appear to shake with quivering vibrations; raps announced the arrival of the communicating spirits; spirit arms and hands emerged, occasionally to write messages or distribute favors to the sitters; musical instruments, particularly Home’s celebrated accordion, produced their own music; spirit voices uttered their pronouncements; spirit lights twinkled, and cool breezes chilled the sitters. If Home announced his own levitation, as he did from time to time, the sitters might feel their hair ruffled by the soles of his feet. But before we segue to Paris of a few decades hence, where we will encounter our Mexican author of destiny, then with a full head of hair, let us float down from the ceiling for a moment, back to the grittier question of roots. . . .
My amiga the food historian Rachel Laudan has a new book coming out-- it's available for preorders now-- which will make not only fascinating reading but the perfect holiday present for anyone interested in food and/ or history-- and who isn't?! She just posted on her blog with all the relevant links plus advice from Yours Truly (which I need to take) on book promotion qua donut promotion. Happy Monday podcast interviews Tina Roth Eisenberg, aka "Swiss Miss"
I pronounce their camel milk soap totally fab.